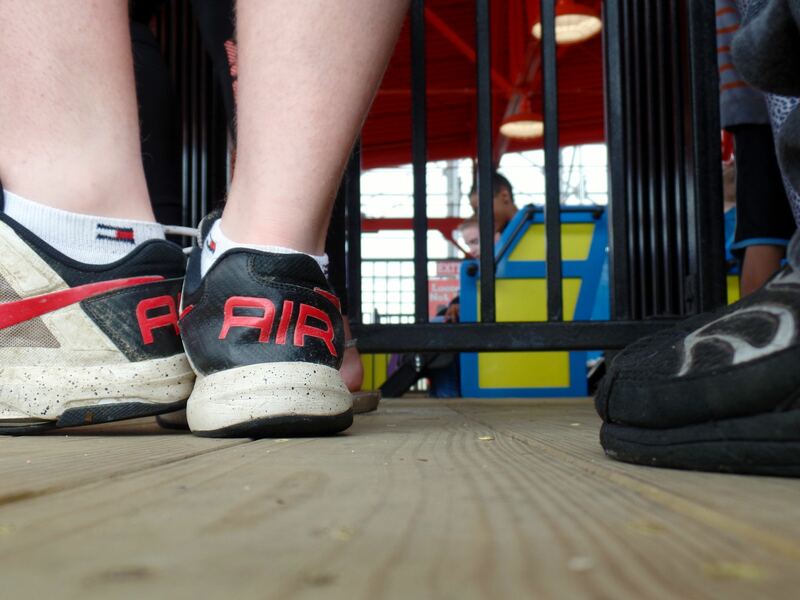 So as I say, the good thing is the rest of the day offered some pretty nice weather for being at an amusement park. The spot where we'd stopped to take a lovely picture of a forlorn patch of park had become bright and sunny and we took photographs to show the contrast. The down side is we didn't have the whole day to enjoy it; it would just be a couple remaining hours. And there was much to see. 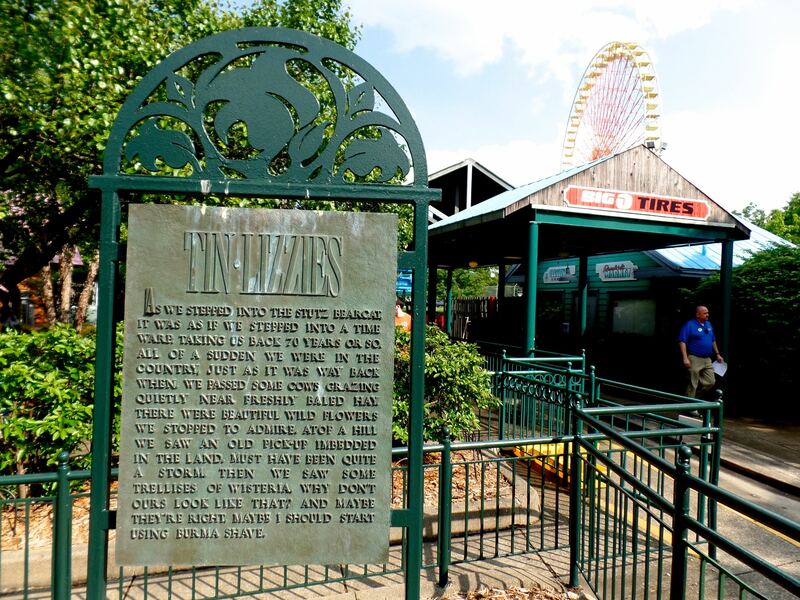 Kentucky Kingdom hasn't got an antique carousel. The park's not that old and it hasn't had the sort of investor looking to put an antique in. But it has got carousels. 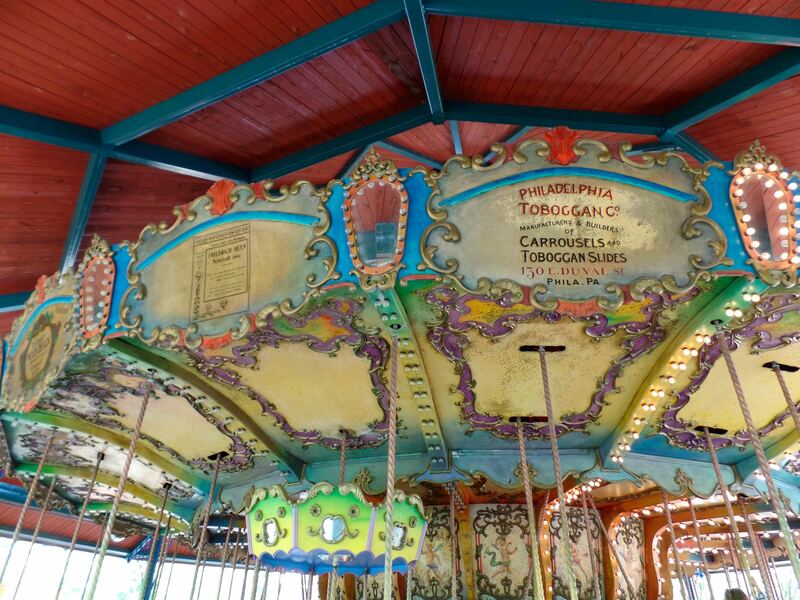 One is a kids-only merry-go-round called the Musical Carousel. All the seats on it are instruments, tubas and the like. It's one of those grand ideas that's just right, nice and silly and a touch whimsical. I can imagine that easily being the high point of a kid's day since, hey, who wouldn't want to ride around a giant bass fiddle? The floor is even arranged to look like piano keys. Its main carousel is the Bella Musica, which seems honestly kind of highbrow for a not-that-old American amusement park. It's a fascinating one, though. It looks like it's got to be modern, certainly. But the mounts are all ... well ... not quite the ``fantasy carousel league'' team that you see on the fiberglass Chance carousels that every park puts in. Those are replicas of highly-regarded carousel figures all put together. The Bella Musica is ... well, all right, a bunch of replicas of highly-regarded figures. But not the normal set of figures. It's almost a crib sheet for understanding antique carousels. There's horses in styles imitating or evoking --- I'm not sure if there are any perfect copies of --- all the major american carvers. There's roosters of a style familiar to English carousels and, particularly, of the Patrina Williams carousel at Great Adventure. There's an elephant gondola of what I think of as a particularly French style, where the bench is inside the animal's back and you ride around in a way that defies all but cartoon logic. Even the decor emphasizes how this is a carousel cheat-sheet of a ride. The rounding boards feature the logos and, in some cases, promotional sheets for the great carousel makers. And not just the obvious ones. Philadelphia Toboggan Company? Stein and Goldstein? Sure, that makes sense. M C Illions and the Spillman Engineering Corporation? Again, yeah, if you're at all interested in carousels you've at least heard the names. C J Spooner, of Burton-on-Trent? That's getting into some serious carousel hipsterism if you're expecting that name to be recognized. Bayol, in France, I know because I've seen their figures at the Merry-Go-Round Museum in Sandusky enough times. The Carl Müller company in Molbitz? H Devos? This is getting to be some serious research. I'm not complaining; it's great, not just because there's a marvelous graphic design sense to, say, the Limonaire Frères (``Manufacture de Pianos et Orchestrophones''), established 1840, even if you can't parse what they might do. It just has that feeling of there being more vision behind the ride than there needed to be. If I remember right, it was running at five rotations per minute, which is a good healthy speed for a carousel. Trivia: A stage play version of Richard Outcault's comic strip Buster Brown appeared in Europe and spawned three touring companies in the United States before its 1904-05 New York City run began. Source:	 The Kid Of Coney Island: Fred Thompson and the Rise of American Amusements, Woody Register. Currently Reading:	 Wings of Madness: Alberto Santos-Dumont and the Invention of Flight, Paul Hoffman.